What are the black stains on the floor of my liner and how do I get rid of them? 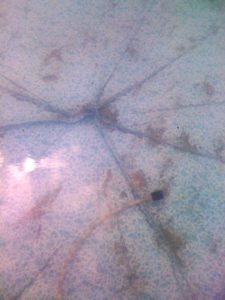 If you have black or grey cloud-like stains on the floor of your in-ground vinyl liner, they are most likely caused by bacteria that is living in the ground under your pool. 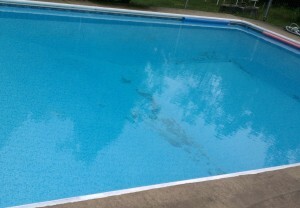 Bacteria sometimes show up years after a pool has been installed. We think the bacteria can be washed into your pool area by flooding rains or when a septic tank overflows. There is little proven research on this topic but we understand the bacteria actually gets sunlight through the water, eats on some food source in the ground and then secretes a dye-like material that migrates through the vinyl and shows up as a stain on the floor of your pool. Often these spots appear grey, greyish green or light black in color. Once the spots appear, the damage to your liner is done and it’s irreversible. Algaecides and other chemicals used in the pool will have no effect on these stains since they can’t get to the source of the problem which is the bacteria in the soil. So you live with stains as long as you can and then, when it’s time to change your liner, it’s also time to try and get rid of the bacteria to avoid a repeat problem with staining. No one knows precisely how to solve this problem but there are four methods that we understand may be effective. You may want to choose one or even try all four. The simplest way to attempt to kill the bacteria is to have your contractor spray the floor of the pool with liquid chlorine before installing your new liner. Chlorine bleach works fine and they will mist the floor of the pool using a garden sprayer three or four times. A second possible solution is to change the pH of the soil under and around the pool. This is done with a chemical called Copperas Iron Sulfate (FeSO4) which is available at tree nurseries or agricultural supply houses. The chemical is sprinkled on the ground around the pool and on the floor of the pool and then the ground is saturated with water for two to three days. The idea is to get the powder deep into the ground so it can change the pH of the soil and kill the source of the bacteria. Since bacteria need sunlight to grow, a third option is to eliminate the light source by putting a black sheet of plastic under the liner. This is not advisable if your yard has a high water table as rising water may float the liner and ball up the plastic underneath causing an even bigger problem than the stain. Finally, some companies are selling a roll-on epoxy-like stain barrier paint to cover the floor and walls of your pool. It’s like a liquid plastic that sets up hard to form a membrane intended to block out the light and prevent stains from getting to your liner. It is the most expensive of the options but some people claim it really works. Discuss these options with your local pool professional and depend on them to suggest which method they have tried and found to be most effective. If you own a concrete in-ground pool and are wondering if it is possible to install a vinyl liner in your pool, the answer is yes, but we don’t suggest it. 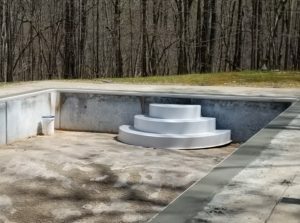 Installing a vinyl liner is perhaps the most inexpensive way to fix a leaking concrete in-ground pool, but converting a concrete pool into a liner type pool should be the last resort. 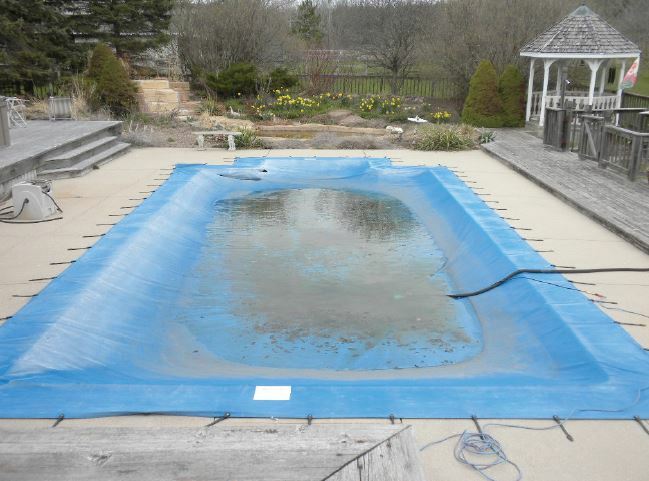 We encourage you to repair your concrete pool if you can. If you decide you must convert your pool, it requires accurately measuring the pool for a liner, installing a bead receiver around the perimeter and then converting the skimmer and other fittings to the liner type that have faceplates and gaskets. 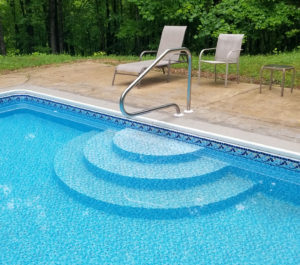 The difficulty of the conversion depends on the internal shape of the pool, whether the contours in the floor are rounded or sharp, and if you have internal steps or other obstacles. Every job is different so depend on your local pool contractor to advise if your particular installation is a good candidate for a conversion. How Do I Remove Wrinkles in My Liner Caused by Heavy Rain? It has rained all season long, wreaking havoc on your backyard oasis, and causing the one thing pool owners don’t want to see – liner wrinkles. During periods of heavy rain, if the water level in the ground becomes higher than the water level in the pool, the liner will float. When the ground water recedes, the liner most likely will settle back into place unevenly, creating wrinkles in some areas and a tight stretch in others. Usually the wrinkles are in the shallow end. Here you see the liner floating up due to ground water after heavy rain. Here are the resultant wrinkles when the bubble re-settles. The solution is to drain the water about one foot back down the slope to the deep end, below the floor in the shallow end. Pull the material back up into place in the shallow end, turn on a vacuum blower (just like during the initial installation), and refill the pool. 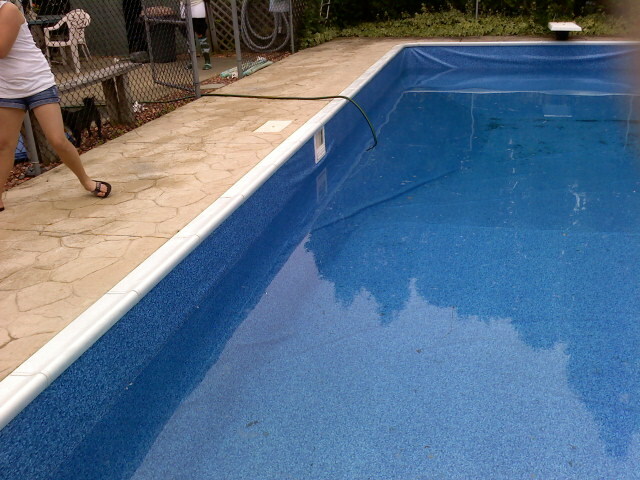 It is easy to get in trouble here, so this is definitely a job for your pool professional. If the ground is still saturated with water, the pool walls may collapse under the extra weight. You may need to wait for drier conditions before attempting to re-seat the liner. If the liner is more than a few years old, it may be brittle and may rip when you try to get it back in place, or tear away from the face plates around the steps and skimmers. The bottom line: It is probably a simple and inexpensive fix. Your contractor just drains some water, re-seats the liner and fills it back up. Be aware that the liner may fail during the process, but if the liner is more than seven years old, it is about time to replace it anyway. Below are more pictures of a liner that floated as a result of excess rain water. You can see the wrinkles caused by the floating and the stretch in the corners. It’s that time of year again. Pool closing season is here, and depending on your regional climate, the process of winterizing your pool can vary. As such, we recommend that you always consult your local pool professional. 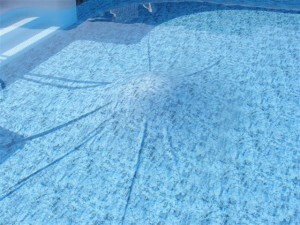 With that said, here are some helpful tips for winterizing a vinyl liner pool. 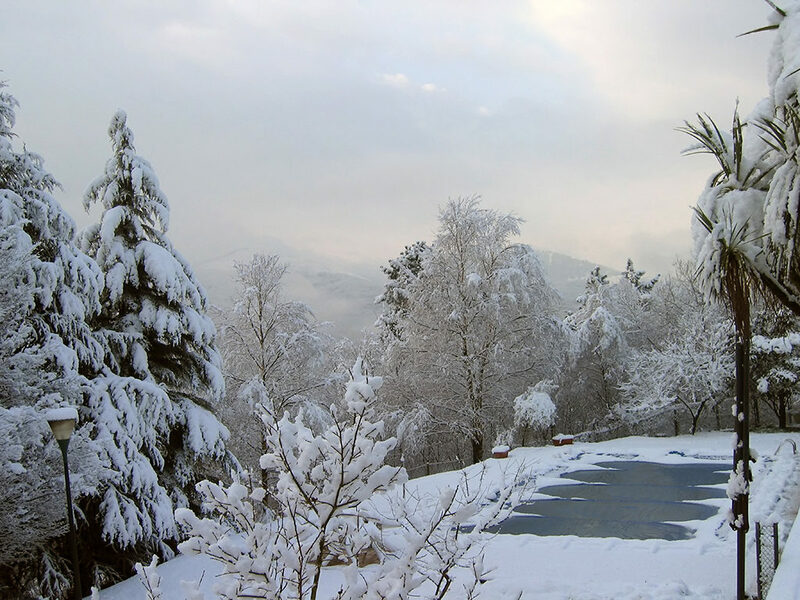 A properly winterized and covered pool can withstand even the harshest of conditions. Watch your pH levels: Maintain a pH of 7.2-7.8 to avoid scaling, staining, or discoloring in the interior of the pool. Dilute and circulate: Do not add chemicals directly to the water. 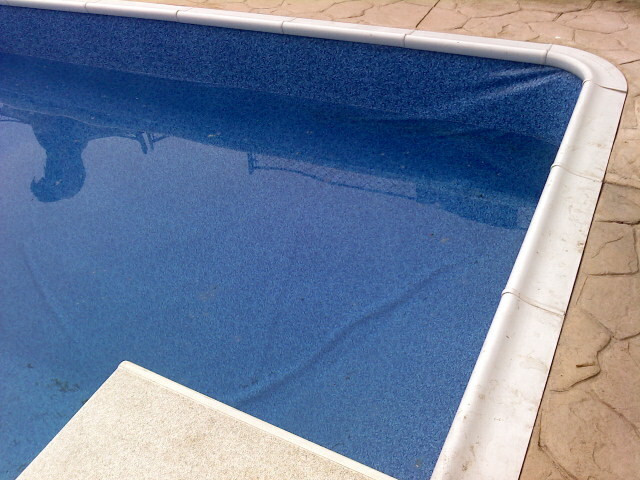 This can cause the chemicals to concentrate on the pool floor, staining or bleaching the vinyl liner. Instead, dilute the chemicals in a bucket and pour them into the skimmer with the circulation system running. Allow the chemicals to circulate for a full 24 hours. Do not drop the water level if possible: Once a pool has been filled with water, the liner begins to lose its stretching properties; therefore the pool should be kept full of water at all times. The water acts as a protector for the liner and holds the liner in its proper position, eliminating any re-stretching or drying out of the vinyl liner. Cover the pool: Installing a safety cover is the best way to protect both your investment and family by keeping out falling leaves and other debris, while also adhering to the safety standards of the American Society for Testing and Materials (ASTM). Click here to learn more about McEwen safety covers. 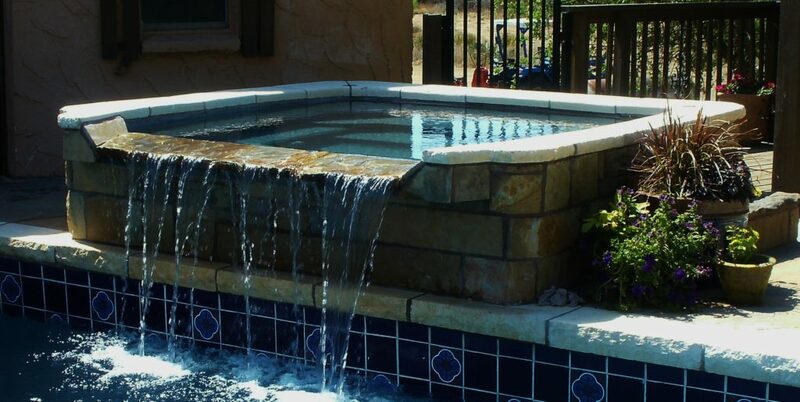 It is now easier than ever to add a vanishing edge spillover spa to your pool! 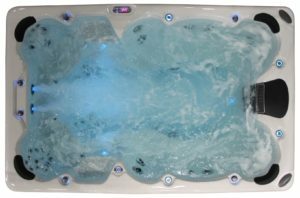 Available in three colors, our spas feature curved steps that lead to a 6 to 8 person seating area with 12 jets. Click here for more information about adding the ultimate waterfall to your backyard oasis! One of the great benefits for those of you who winterize your pools with a safety cover is that it keeps your liner out of the sun and chlorine-free for perhaps six months of the year. A liner is a big investment, and you want it to last as long as it can. 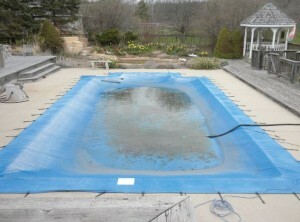 Properly winterizing your pool and using a safety cover can greatly extend the life of your liner. A Safety Cover not only keeps your liner out of the sun and chlorine free, but it keeps your swimming pool free of the debris that would otherwise create a mess in an uncovered pool. Protecting your pool from debris will also save you money on costly seasonal maintenance such as re-painting and re-plastering, and eliminate the need for messy spring clean-ups. 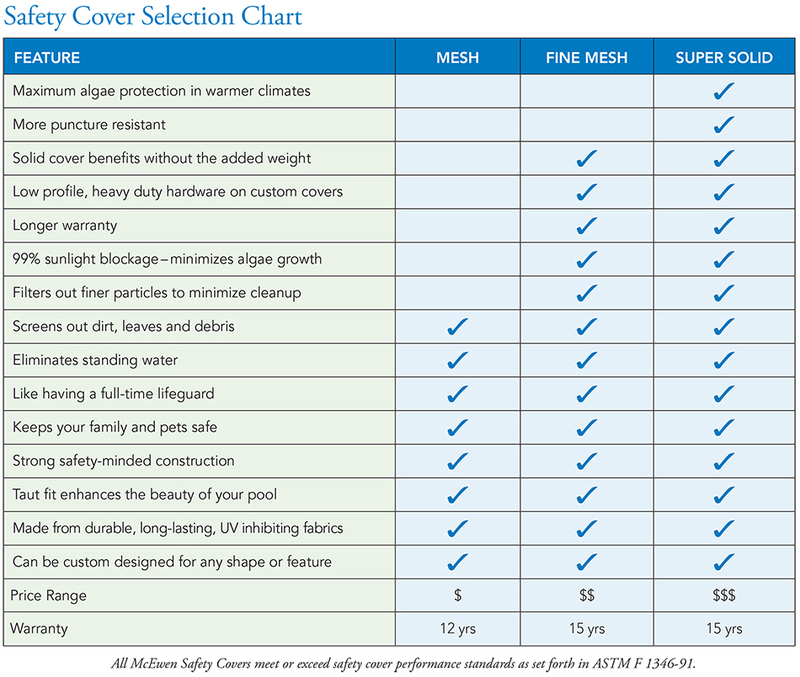 Below is a breakdown of our safety cover materials. You can also click here for more information on safety covers. How do I replace my bungee-style cover with a safety cover? When a dealer replaces any existing safety cover, they want to match as many anchors as possible. This will minimize the number of new holes they have to drill into the deck. Please check out our effortless anchor matching service at MatchMyAnchors.com. It is, however, much more challenging to match your anchors when replacing a bungee-style cover. 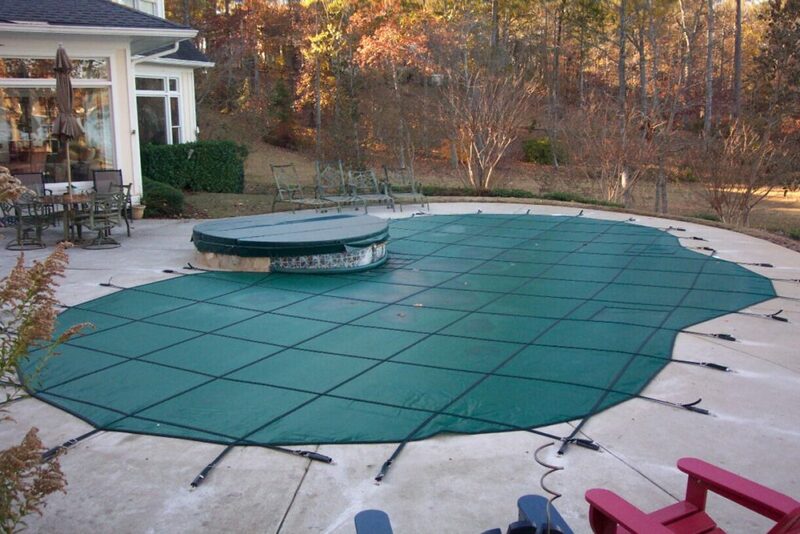 These non-safety covers were designed to drape down onto the pool’s water for support. 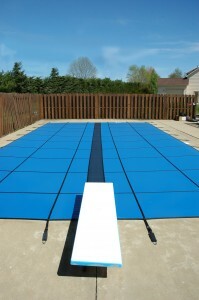 For this reason, they are larger than a safety cover will be for the same pool. This means we cannot use the bungee cover as a template to make a replacement safety cover so your dealer is are going to have to measure anyway. The question is, how do they measure to hit as many anchors as possible? The answer is different for rectangle pools than it is for custom shape pools. 1- To match most of the existing anchors we can produce a custom cover on 4’ spacing. Your dealer just provides the pool size, the distance between the anchors and the distance from the pool to the anchor line and we do the rest. The only negative is your dealer will have to measure the anchors and you will pay the price of a custom cover, which will cost you about 50% more than the same size stock cover. 2- If you would like to save the cost of a custom cover you can just order a stock cover and take your chances. The 8 corner straps are going to match anyway. Your new stock cover only needs anchors every five feet or so and the existing bungee anchors are spaced every two feet anyway. This means you have lots of existing anchors to choose from. We should be able to match at least half of the anchors on the remaining sides. Your dealer will have to drill new holes for new anchors in the remaining locations but you will enjoy a nice price savings. The custom cover will cost the same whether we attempt to match the anchors or not so we might as well try. If A-B’s are being taken for the pool anyway, your dealer will A-B the anchor heads too and we will design the new safety cover to hit as many anchors as possible. We will not hit every anchor because the existing anchors were not designed on a grid where you have one anchor opposite every other anchor like you have on a safety cover. Instead, on the original bungee cover they just started at some point and sewed straps on every two feet around the perimeter. If there is an anchor in the deck opposite one on the other side, it’s just by chance, not by design. Drilling some new anchors will always be necessary. Renovate your pool with one of our interior drop-in steps. Adding a new vinyl covered step has never been easier! Check out these before and after pictures of a McEwen wedding cake step with the Pence liner pattern. 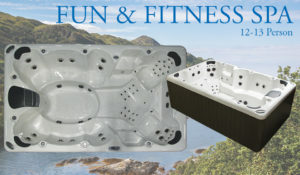 The future is here with our Fun & Fitness spa! This spa is a combination of a swim spa and a large portable spa. 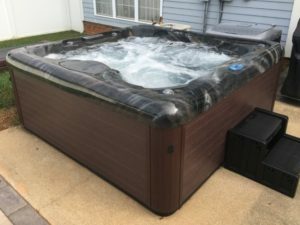 It is designed to allow you to work on your exercise routines, such as rowing or swimming, while allowing you to have a 12-13 person seated hot tub at the same time.